I am posting my favourite two food poems. Anita‘s poem is very simple and simple poems can be a great way to create a strong image. I think Emily was inspired by a funny food poem of mine (see my note under her poem) and brought her own imagination to it. I am always happy for you to use my poems for inspiration! Congratulations girls. I am sending you both a copy of my book The Letterbox Cat. I just need to order some more so you may have to wait a bit! Emily R, 10yrs old, Yr. 6 who goes to Hobsonville Primary School. I think Emily was inspired by a poem I have in Macaroni Moon! It’s called ‘Nutty Food.’ I like the way she changed the second part and made the poem her own. Brava! Food poems make me hungry! This entry was posted in Uncategorized and tagged food poems, poems by children on June 12, 2015 by Paula Green. Thank you for sending in scrumptious poems for the food-poem challenge. I really enjoyed reading them all. I am posting a few of my favourites along with the winners. If you missed out this time do send in a poem in the holidays and do try my competitions next term. There are two winners today, one older and one younger. Sophia’s poem is like a little story that makes you think of the food you don’t like (for me tripe and junket!). I really like ‘like a bubble of butter that’s burst’. 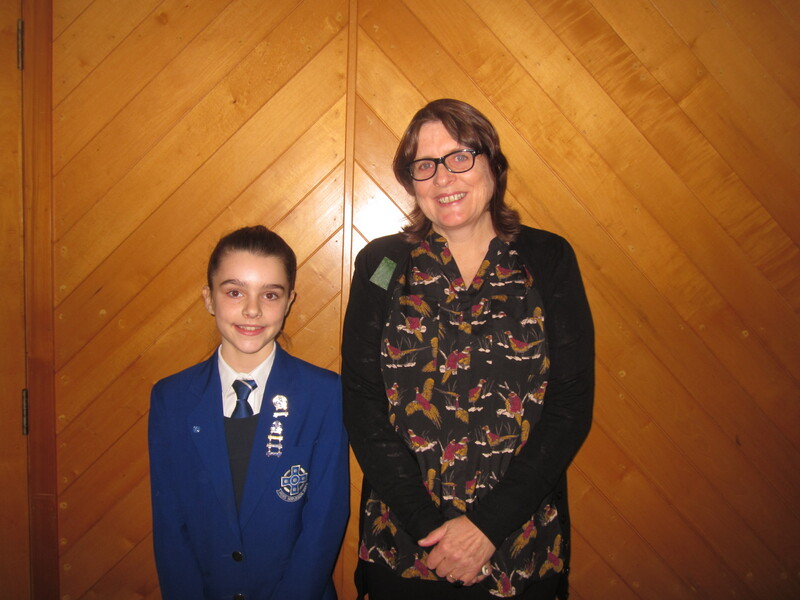 I got to meet Sophia last week as I judged the poetry competition at St Kentigern Girls’ School. She won the Year 7 section with her wonderful ballad. With her permission I have posted the photo of us. It was lovely to meet her. I am sending Sophia a copy of my book Macaroni Moon (illustrated by Sarah Laing, Random House, 2009, now out of print!). like a bubble of butter that’s burst. my cat’s plate for her to devour. and we’re having my favourite pie. it doesn’t look natural or right. I close my eyes and lick it. who cares if it looks like the recipe should? I’m glad I gave it a try. and I can have my chocolate pie. Izzi sent in this poem and I really liked the simple rhythm and rhyme. It is a good poem to say out loud. Great job Izzi! Thanks to Scholastic I am sending you a copy of Marmaduke and the Marmalade Jam (by Juliette MacIver, illustrated by Sarah Davis, Scholastic, 2013). It also has great rhymes and rhythms. You might be inpsired to write more when you read it! that is ready to bake. Sarah Dickson’s Year 5 and 6 class from East Taieri School sent in these food poems. I think they had fun writing them! Ice cream and bread hurts my head. Chocolate and peas make me fall to my knees. Flour and coffee makes me hoppy. Ham and jam helps me drive my van. Potatoes and cheese causes me to sneeze! Peas and flour – I really need a shower. Jam and cheese oh no I am going to sneeze! Sugar and powder is so sour. Porridge with fish, oh what a dish. Spaghetti and flour now I need a shower. Toothpaste and cheese I don’t want that please! Apple and coffee makes me toffee! Sausage and pork makes me snort! This entry was posted in Poetry and tagged East Taieri School, food poems, Otari School, poems by children, Poetry competition, St Kentigern Girls' School on July 7, 2013 by Paula Green. I was going to post some food poems by other poets but have been too busy on the children’s anthology to get permission so will post one of mine instead. The bad news is I won’t be able to tell you which children are going in the book by the end of June, but the good news is I know there will be more than five! I know it is hard waiting to hear things (I am doing it for something I have written at the moment and I know whatever happens I will just get on and write another poem because that is what I love to do!). I really like the idea of writing a food poem that takes me to a special occasion or another country or another place. Food is a great sparker of memories. I will do this soon! But I have to get to work on the anthology so I will post these funny poems from Macaroni Moon (published by Random House in 2009 now out-of-print). I tried to think of crazy food combinations in the first one, the second one is a short poem where I wonder something, the third one is a longer poem where I wonder something, I mix the beginnings of words up in the fourth poem and in the last one I mash up words. I had fun! and all we’d do is eat! MOON on crackers, cauliflower MOON sauce. on the bed as I read. chish and fips for dinner? This entry was posted in Poetry and tagged food poems, Macaroni Moon, poems for children on June 21, 2013 by Paula Green. Here are some starting points (or ideas) for poems with food in them. 1. Write a poem with your favourite food in it. Hunt for delicious words that make the food simmer and steam in the poem. 2.. Write a poem with your least favourite food in it! Hunt for words that show us why you don’t like the taste. 3. Write a list poem with food in it (food beginning with the same letter, all vegetables, all cold things, all hot things, summer food, winter food, what your dog eats, what your cat eats, what you eat when you go to stay with your grandparents, … ). 4. Write a poem with food in it that makes you remember someone (your aunt, uncle, nana, granddad, mum, dad, brother, sister, friend …). 5. Write a food poem that makes you remember a place you visited. 6. Write a poem with food in it that takes you to a different country. 7. Write a disgusting food poem or a funny food poem. 8. 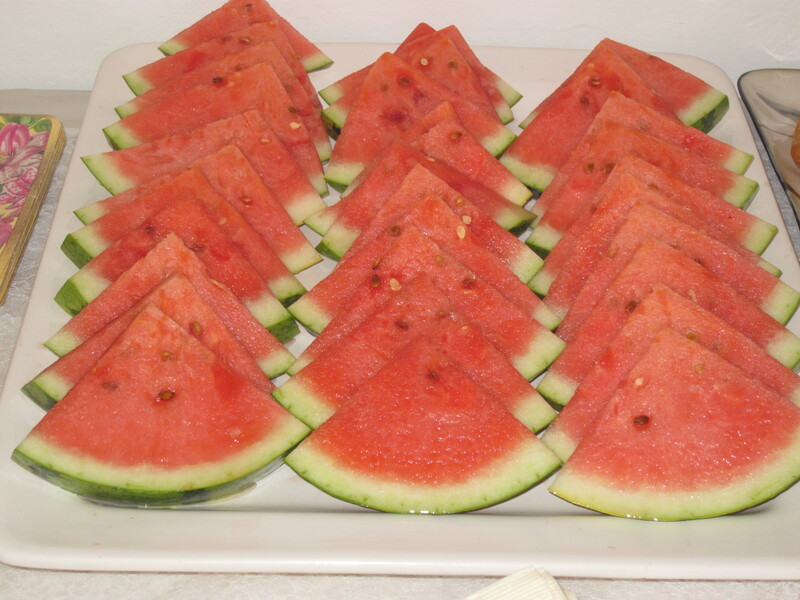 Find some good similes for food. 9. Write a poem that has no more than twelve words about the most delicious thing to eat in the world. 10. Write a poem about what is in your lunch box. Don’t forget to send your poem to paulajoygreen@gmail.com. Include your name, age, year and name of school. You can include your teacher’s name and email. You have until Thursday July 4th 5pm. This entry was posted in Poetry and tagged food poems, poems by children, Poetry challenge, starting points on June 18, 2013 by Paula Green. People are already talking about the food in my new book of poems (The Baker’s Thumbprint). I got asked about it when I did my radio interview with Lynn Freeman and the one for the Nelson Mail. And I always say I love food (I love to eat it and I love to cook it!) as much as I love writing (I love to read as much as I love to write!). So I have decided this week it will be food week (and maybe the next few! ), but I am going to add something extra and that is the wonderful world of similes. We are also going to play with these. On Monday I will set you a food-poem challenge with a simile twist, on Tuesday I will give you some starting points, on Wednesday I will give you some poetry tips on similes, on Thursday it is time for poetry play, and on Friday I will share a food poem. The tasty food-poem challenge: I challenge you to write a poem with food in it AND at least one simile. Tomorrow I will give you lots of starting points for food poems but my tip is to go on the hunt for words that will make my mouth water. Your poem might be from your imagination or it might be from a real experience. I am hoping some younger children will give this a go! You can be from Year 0 to Year 8! Your poem can be really short or long (but no more than 20 lines). Send to paulajoygreen@gmailcom. Include your name, age, year and name of school. You can include your teacher’s email and name if you like. You have until Thursday July 4th 6pm. The first winning poem (older) will get one of my precious copies of Macaroni Moon (I have only got a few left and it is out-of-print!) plus a a tasty cake of chocolate (ooh I hope it doesn’t melt in the post!). 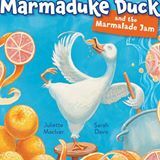 The second winning poem (younger) will get a copy of the glorious Marmaduke Duck and the Marmalade Jam by Juliette MacIver and Sarah Davis thanks to the lovely Scholastic (and a cake of tasty chocolate). This picture book is all about food. Everybody wants to taste Marmaduke Duck’s marmalade jam and things go a bit wrong before they go a lot right! stirred it, tested it, tasted it, toiled. And if I have some extra favourite poems I might have to get some extra cakes of chocolate to post you! This entry was posted in Poetry and tagged food poems, Juliette MacIver, Macaroni Moon, Marmaduke Duck and Marmalade Jam, poems by children, poems for childrern, Poetry challenge, similes on June 17, 2013 by Paula Green.